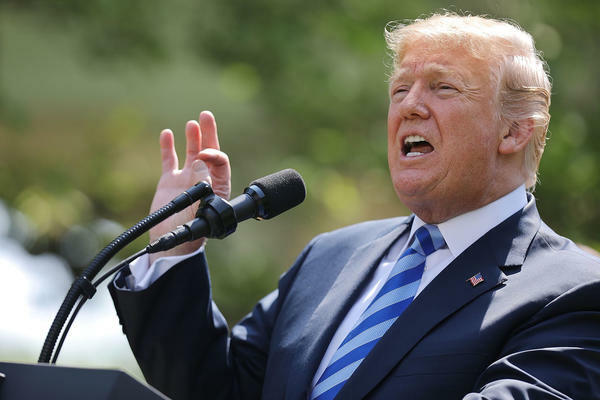 In a speech Friday, President Trump announced a plan that lists dozens of "potential" steps his team may take to lower drug prices, along with many others that were included in his budget proposal and will require congressional action. There were few concrete actions taken today. The plan mostly lists dozens of "potential" steps the administration may take, along with many others that were included in the president's budget proposal and will require congressional action. Several options are "requests for information." Nevertheless, the president characterized the proposal as "the most sweeping action in history to lower the price of prescription drugs for the American people." "We will have tougher negotiations, more competition and much lower prices at the pharmacy counter and it will start to take effect very soon," Trump said. The president was accompanied by Health and Human Services Secretary Alex Azar, who played a major role in developing the plan. Trump said he wants to eliminate "middlemen" in the drug industry — which includes pharmacy benefit managers and wholesalers — and he criticized industry lobbyists for making a fortune at the expense of taxpayers and patients. U.S. patients spent nearly $329 billion on prescription drugs in 2016, according to the National Health Expenditures Survey. That's an increase of about $100 billion in the past 10 years. Many researchers say the biggest reason behind the rising spending is high prices for prescription drugs. Often, companies are rewarded for setting a high retail price because insurers negotiate discounts off that initial price. The blueprint released Friday reiterates proposals that were included in the White House budget proposal. Those include allowing Medicare's prescription drug plans to slim down the number of drugs they pay for to spark price competition among pharmaceutical companies, and capping how much money Medicare patients themselves can spend on drugs each year. "On the positive side, I will say that HHS does seem to be paying close attention to this issue, given all the issues they bring up in the blueprint document," says Walid Gellad, director of the Center for Pharmaceutical Policy and Prescribing at the University of Pittsburgh. "On the negative side, it's a bunch of questions, not a specific plan for how to proceed." Azar, in a briefing following the Rose Garden speech, acknowledged the plan is sweeping and would take years to implement. He said the administration will pursue those ideas it can get done. "This is a major restructuring of a huge portion of the U.S. economy. One doesn't do that lightly," he said. The plan, like the budget, also proposes limiting price increases Medicare would pay to the rate of inflation and changing some rules around generic drug approvals to prevent companies from blocking new generic competition. Many of those ideas would require legislation and congressional approval. Azar, in his briefing, emphasized his desire to change the way pharmacy benefit managers operate — specifically a system where they negotiate rebates off high drug prices. "We are calling into question today the entire structure of using rebates in the pharmacy channel," he said. The president also wants to take steps to ensure foreign governments don't get lower prices for drugs than do U.S. taxpayers – which he referred to as "global freeloading." "It's unfair, it's ridiculous, and it's not going to happen any longer," he said. Critics say that proposal is unlikely to help lower prices here in the U.S.
"Lifesaving medicines aren't more expensive here because they cost less elsewhere," Jason Cone, executive director of Doctors Without Borders USA, wrote in an article published in The Hill. "They're priced out of reach everywhere because pharmaceutical corporations are charging exorbitant prices simply because they can—and the U.S. government lets them." One thing Trump did not propose was allowing Medicare, the government health care program for the elderly, to directly negotiate lower drug prices for its beneficiaries. That's a change from his rhetoric during his campaign and transition. "We're the largest buyer of drugs in the world and yet we don't bid properly," he said at a news conference in early January 2017. "We're going to start bidding and we're going to save billions of dollars over a period of time." But shortly after Trump moved into the Oval Office he wavered on that commitment, first saying that he didn't want Medicare to engage in what he called "price fixing" and then, through his former spokesman Sean Spicer, saying once again he favored allowing the federal government program to deal with drugmakers to get lower prices. Medicare accounts for about one-third of U.S. prescription drug spending. Current U.S. law prohibits Medicare officials from interfering in the negotiations between drugmakers and the insurance companies that administer Medicare's prescription drug plans. The only government report that looks at the issue is a 2007 Congressional Budget Office study that concluded it would have a "negligible effect" on prices. But Gellad says that report was limited, because it looked only at the effect if Medicare were not allowed to exclude drugs from its coverage list. "There is no evidence that allowing Medicare to negotiate doesn't help," says Gellad. "In fact, the CBO said that in certain circumstances, with the right formulary, this type of negotiation could help." Today President Trump laid out his plan to deal with the high and still-rising prices of prescription drugs. He called it the most sweeping proposal in history, and he promised people will see results soon. PRESIDENT DONALD TRUMP: We will have tougher negotiation, more competition and much lower prices at the pharmacy counter. And it'll start to take effect very soon. KELLY: The president spoke in the Rose Garden. And as he spoke, the Department of Health and Human Services released what it is calling a blueprint for lowering drug costs, a blueprint that NPR health policy correspondent Alison Kodjak has been poring over. And she is here now to tell us all about what's in it. Hey, Alison. KELLY: So what's in the plan? KODJAK: So the president called it sweeping, and he's right. It touches on everything from the drug approval process, the patent system, the incentives that drive the drug prices higher and even how Medicare works and foreign trade. And it tries to lower prices for individuals but also addresses the overall cost of prescriptions to the whole system, to the economy. But a lot of what's laid out are just ideas. And, you know, they're good or bad ideas, but they're ideas. They're not concrete proposals. They're things the administration wants to study or ask for feedback on. KELLY: Are there any concrete proposals in here? I mean, are there specific ideas for how they're going to lower drug prices? KODJAK: ...Them to sort of say, oh, maybe we shouldn't give it a thousand dollars a pill for this drug. So the idea there is to, you know, shame them I guess into lowering their prices. KODJAK: (Laughing) That would be funny. KODJAK: Yeah. And then there's a bunch of proposals that are aimed at middlemen in the pharmaceutical industry. And the president really seemed to have his sights on that one. Here is what he said. TRUMP: We're very much eliminating the middlemen. The middlemen became very, very rich, all right? TRUMP: Whoever those middlemen were - a lot of people never even figured it out - they're rich. They won't be so rich anymore. KELLY: All right, Alison Kodjak, help us figure out who these middlemen were and what exactly the Trump administration wants to do to make them less so. KODJAK: Yeah, so they're, like, what are called pharmacy benefit managers. These are the people like Express Scripts or CVS Caremark that implement your pharmacy program for your insurance company or your employer. But a lot of people say they play both sides. They negotiate rebates, and then they take a share of it. So it's in their interest to see drug prices higher. So what Health and Human Services Secretary Alex Azar said after the president's speech was they want to eliminate the whole rebates system, and that would really change how drug prices are - how drugs are sold across the country. KELLY: You're telling me a lot about what the administration wants to do, what the administration might do. KELLY: How likely that all of this is going to come to pass and how soon? KODJAK: Yeah, so some of this stuff was in the president's budget, and they need Congress to pass it. So it's unclear what will happen there. And a lot of these, like I said, are - they're asking for information. And as Secretary Azar said, many of these ideas may take many years to implement. KELLY: NPR's Alison Kodjak, thanks so much. KODJAK: Thanks, Mary Louise. Transcript provided by NPR, Copyright NPR.